You just can’t dress too much like yourself. Oh sure. Situations. But … even so. You should always look like YOU in those situations, whatever they are. I worry often about dressing just … too too. Too too sweet – am I becoming mutton dressing as lamb? Too too bohemian… do I look like I’m wearing a costume? But when I get compliments, that’s how I’m dressed. Not sensibly. Nope. Utterly insensibly like myself. My two dearest friends could not look more unlike. One of them is tall and slender, and she looks amazing the more dystopian and punk she dresses. I have – no joke – seen her rake in compliments dressed in a plain black dress that she’d slept in the night before! (Do not try this at home). She currently has one side of her glorious mop of red curls shaved… and it made her look more like herself than ever. I keep trying to convince her to wear woad stripes. The other friend has the delicate coloring of a Waterhouse mermaid – but her personal style runs classic Americana. A classic pair of boot-cut jeans, solid shoes and a tasteful sweater? Her grin stretches from ear to ear, she relaxes, and so do you. Calvin Klein is her designer of choice, and (her shades of ) red, white and blue are always favorites. Do you have any idea how horrible I look in a plain black t-shirt dress? I assure you, if I were to wear one, you’d try to hospitalize me, not compliment me. And while my bestie can rock a sailor blouse, it’s too blocky and formal for me. We are not meant to dress the same way. Praise the Lord, it is no longer 1970, and there is no reason to protest a department store because you hate the new hemline. You have freedom of choice! Yes. Styles go in and out, but there is so much leeway now – you can feel free to dress in the clothes that look best on you and not give a hang about what the latest trend might happen to be. Yes, of course we have situational rules of dress. My dystopian friend should probably not wear distressed t-shirts to an office job (if one can imagine her in such a prison), but she certainly could dress like her version of David Bowie and be both appropriate and fabulous. My mermaid hates getting dressed up these days, but if she does – it’s not in five yards of lace. It’s more likely to be something understated and elegant. Dress like YOURSELF. If it’s like you – the real you – do it. Take a chance. Push the envelope. See how it feels. You only look like you’re wearing a costume when you’re trying to be someone you are not. Successful hunt: Eshakti online. I’ve ordered two more dresses, having added a couple of inches to my shoulder-to-waist measurement, and they’re lovely. A great deal. You MUST know your colors and style lines to make this work – but if you do, you’ll have a good time. (Watch thy fabric content). Note: Necklines, hemlines, sleeves are usually changeable on their designs – so if you like something but wish it came a foot shorter/longer or wish it covered a bit more territory up top? Doable. Takes a couple of weeks to arrive. This is not Amazon. Price point? Entirely reasonable. I’m spending what I would normally spend on fabric and notions to make myself comparable clothing. Continuing adventures: As an aesthete, I’m all about the full effect of my presentation, very much including how I smell. Unfortunately, regular perfumes and my body chemistry don’t get on. I’ve been searching for a signature fragrance for years. I’ve found a few almost-rans, but nothing that I fell in love with. And the esoteric scents that I love tend to be very difficult to sample – and sample I must. I’ve been doing business off and on with BPAL, but they’ve gotten a bit *much* with the branding. And it takes a long time to get samples… one is never quite sure what you’re going to end up with. I loved one of the random samples they sent me (Paris), it’s darling – and it disappears in an hour. -sigh- But that was enough to send me on the hunt. Online, natch. I found a new shop, loaded up my cart with $6 perfume samples (that’s about the standard price point for a sample vial in my experience), and am anxious to let you all know of a new source for perfumes. They have a million options on that site… hopefully I will fall in love. (Stay tuned). I was bummed to find that Wintersilks has discontinued most of their daytime clothing, although I recommend them as a source for real silk underthings and nighties. Silk, if you are unaware, is a magnificent insulator. Well, stick to your strength – always a good move for any retailer. Etsy is a marvelous place to get leather goods. Again – buyer be aware. One must examine the pictures closely and read the details. I just scored two vintage leather belts, and I spent no more than I’d have spent on pleather in the mall. They’re beautiful belts, and appear to have been barely worn. Shopping online success? KNOW your colors and stick to them. KNOW your fabrics, or you’ll end up with trash. If it’s too cheap to be believed, … it is. KNOW your style lines and stay close. Online clothes shopping isn’t a good place to take chances, unless you’re really willing to send things back en masse – I hear this is popular, but I don’t have time for that nonsense. The dressing room remains the place to try wild new things – you should! – not the computer screen. (Call me old-fashioned if you will – I take it as a compliment). Utilize online review sites that aren’t the website itself if at all possible – the website can edit its reviews. One of the banes of modern shopping existence is the difficulty of the hunt. The standard mall stores are progressively less imaginative and less stylish, with progressively lower quality garments. Online retailers are everywhere – but what’s a girl to do if she’s not a standard size? Sending piles of clothing back is just a pain in the behind. Enter Eshakti. They offer custom-fit clothing with a wide variety of options. You start with one of their pre-designed dresses and then for a $10 fee, you can change the hemline, neckline, and sleeve. Included in that $10 fee is custom fitting – so you can have your dress made to measure. I am very hard to fit, and I’m not the only one out there with Fit Issues. So the idea of having someone not-me make a dress for me was very tempting! But I don’t trust easily, so I kept my bets minimal. I knew if this dress wasn’t quite right I could repurpose it. It is surprisingly difficult to take a picture of a navy dress indoors… but suffice to say that my 5’2″ self has a dress that fits nicely through the bust, the waist, with a perfect armlength and hem. I knew going in that the fabric was poly/spandex, which is possibly my least favorite fabric. But I wanted velvet for my husband. 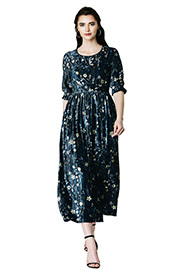 It’s a nice weight – I will be quite warm in this dress, it’s definitely *winter only*. (I live in SoCal, you could wear this in Spring/Fall elsewhere). The only odd thing is what I noticed when I checked other gal’s reviews of Eshakti – the waist is high, even though I submitted a shoulder-to-waist measurement. No worries – the back waist is also elasticated, and there’s not a ton of difference in my waist and lower-rib measurements. Next time I order, I’ll add a couple of inches to that measurement. I also decided to purchase a blouse from their “ready made” section. Although I generally buy a size 14, the measurements put me in a size 16. I was surprised to pull this blouse on and find that it fits beautifully. 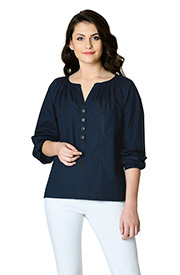 Dark navy is a bit dark on me, but I’ll get plenty of wear out of this – eyelet cotton blouses are a basic in my wardrobe. Fabric here is a nice cotton, good weight – and it unexpectedly came with a woven cotton tanktop in a lighter navy which also fit perfectly. I’m sure it’s going to get worn under other garments! My only beef was the amount of time this took – which is a silly first world complaint. This is made in India, and I got in in a couple of weeks. Custom clothing. I should complain? Well. So you know – you’re not getting this overnight. In sum: Worth the money, especially as I had an introductory sales price. (I hear that they often offer sales). Add shoulder-to-waist length for custom made articles. Be mindful of what you’re getting and know your proportions, and this is a good place to get some interesting clothing. This post is in no way sponsored by Eshakti – it’s sponsored by my belief that we need more sensible shopping options!